This outermost layer of cortex receives cerebellar afferent called climbing fibers. Among all afferents to cerebellum, these are only olivocerebellar fibers. Entering through inferior cerebellar peduncle and traversing through white matter these fibers climb up to the outermost layer of cortex. These fibers divide into numerous branches which wrap around the bushlike dendritic tree of Purkinje cells in molecular layer. These are called climbing fibers as they look like a vine on a tree. One climbing fiber forms synaptic connections with dendritic tree of 1–10 Purkinje neurons through which all the times excitatory sensory inputs are discharged on Purkinje cells. Neurons present in molecular layer are stellate cells and busket cells. Stellate cells are small starshaped superficially placed cells. Axons of these cells relays in dendritic spines of Purkinje cells to produce inhibitory effect. Busket cells are placed in deeper part of molecular layer. These are so called because multiple axon terminals give a busket-like appearance to hold the Purkinje cell body. Through this connection excitatory impulse of Purkinje cells are limited. Molecular layer also receives axons of granule cells situated in granular layer. In this layer long axons of granule cells divided into T-shaped manner. Two limbs of T-shaped axon of granule cells run in opposite direction which synapse with Purkinje cell dendritic spines. This layer is made up of single row of cells called Purkinje cells. These are large, flask-shaped Golgi type I neurons. Dendrites of these cells are like tree bush showing primary, secondary and tertiary or final branching. Final branches present dendritic spines. Whole dendritic process extend into superficial molecular layer. Long axons of Purkinje cells acquire myelin sheath on entering granular layer. These pass further deeper to relay in neurons of cerebellar nuclei. Axons of a few Purkinje cells end directly to vestibular nuclei, without relaying in cerebellar nuclei. This layer is so called because it is filled with densely packed, small sized, multipolar neurons called granule cells. The cells present scanty cytoplasm with deeply stained nuclei. Granule cells are intermediate in position between all the afferent fibers to cerebellum other than olivocerebellar group and the Purkinje cells. These cerebellar afferent fibers are known as Mossy fibers. Granule cells present four to five dendrites which present claw-like endings. Mossy fibers, which are all the afferents, other than olivocerebellar fibers (climbing fibers) reach upto granular layer where they show multiple branching. These fiber terminals form synaptic connection with claw-like dendrites of granule cells. One mossy fiber forming synaptic connection with thousand of Purkinje cells, thus producing diffuse excitatory effect. 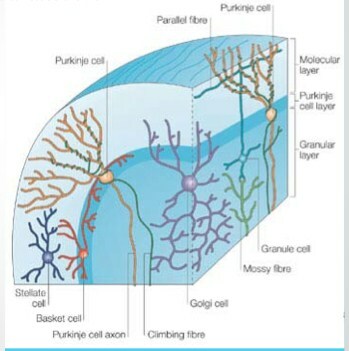 Axons of granule cells are long enough to reach upto superficial molecular layer traversing through Purkinje layer. Terminal end of granule cell axons divide in ‘T’ shaped manner, ends of which run in opposite direction which are called parallel fibers. Ends of parallel fibers form synaptic connection with dendritic tree of Purkinje cells at right angle. Second type of neurons in granular layer are Golgi cells. Their dendrites are spread out in molecular layer and axon split up into branches which form synapses with dendrites of granules cells at the site of their junction with mossy fiber terminals which form glomerulus. Neuroglial cells are also abundant in whole granular layer.